Another “new” BG meter, but just to be clear, this meter is not in Australia yet. It is not yet approved by the Therapeutic Goods Administration (TGA) and thus commercially this can’t even be mentioned in Australia by the manufacturer. It is already supported by the Accu-Chek Connect phone app. If it does eventually get TGA approval then you’ll see it mentioned a lot more. But until then, this is at least a little bit of background information on the meter. The meter is already known in other parts of the world, and all the information presented here was extracted from the product’s regulatory filing in the US, or from people overseas who’ve seen the product. All that filing documentation is publicly accessible, and the public like us can find it as long as we know where to look. I’ll summarise it here for you. The meter is the Accu-Chek Guide Me, and it’s basically just a cut-down version of the Accu-Chek Guide which we already get in Australia (see the Accu-Chek site). As I’ve written in the past, the Guide is one of my favourite meters. It uses the same strips as the Guide, so has the same advantages of accurate performance (one of the reasons the Guide is one of my favourites) and the spill-resistant strip containers. It uses the same batteries. It also has Bluetooth to connect to your phone. But the menu interface is simpler than the Guide’s, and the pairing PIN is simply printed on the back of the meter (instead of randomly generated each time). Instead of a matrix LED display, it has a cheaper fixed-segment LCD display. 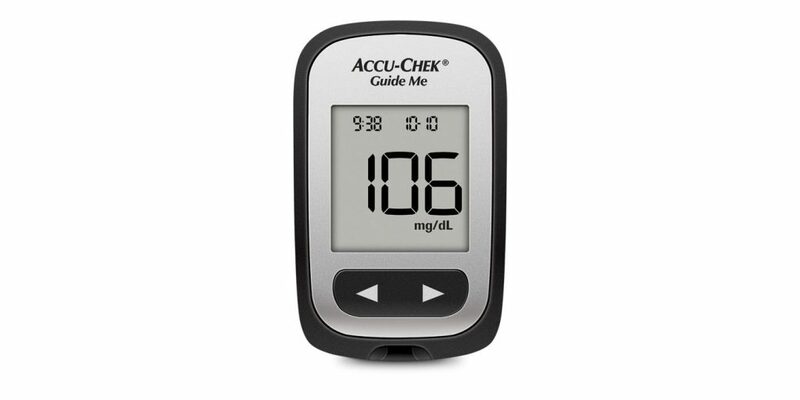 That’s similar to the Performa II (see the Accu-Chek Performa site). I’ve written about the Performa in the past. Note however that like the Performa, the Guide Me doesn’t have an illuminated display, so is not so convenient for nocturnal testing unless you turn the bedside light on. The control interface overall is simpler. Instead of 4 buttons on the front of the meter it has two on the front and one power button on the side. The menus are in fact very reminiscent of the Performa meter. So simple that there’s no need for multi-language support like the Guide has. Apart from the simpler interface, there are a number of missing features compared to the Guide. There is no eject button, and there is no light to illuminate the strip (which makes sense if you can’t see the LCD in the dark either). While having an accurate meter is very important (and being able to link it to an app is very useful) I do prefer the extra features of the Guide. If having a cheaper version available in the Guide Me makes it easier for more people to take advantage of an accurate meter, that’s great. Someone has to absorb the cost of the meters (which many of us get for free) and cheaper meters may mean more meters on the market. But I hope the original Guide won’t go away in a hurry. If the Guide Me meter does eventually appear in Australia, at least now you’ll know what it’s about. The guide is a fine meter. One of the better non contour meters out there.